Shaun in Japan: Christmas in Tokyo, Part 2. Now we'll get to the moment you've all been waiting for, the actual Christmas day. As I mentioned in the previous post, we'd made plans to get together with Kali, but due to Navy scheduling awkwardness, that all fell apart at like 1am, and we decided to do our gift exchange on the 26th instead. So we made plans for late afternoon and evening with my friend Lynne and had to come up with something to fill our morning. Shannon and I exchanged presents and read Christmas cards from the family, and it was really delightful. Then we decided to head out. We missed out on a lot of the things in Tokyo that Shannon wanted to see because it simply takes too long to do things here, especially when you sleep till noon and you live an hour out of the city. 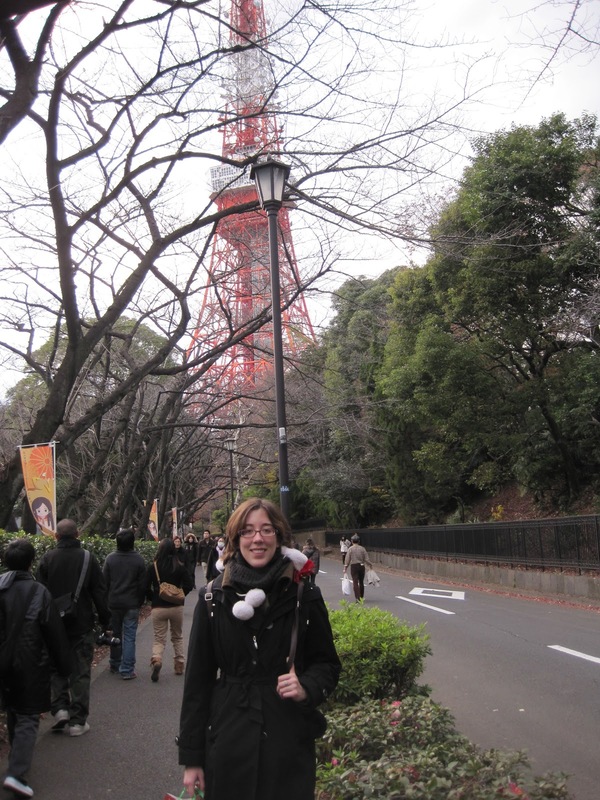 But the one thing we couldn't miss was Tokyo Tower. If you're sick of seeing Tokyo Tower on my blog or my Facebook, just take a deep breath and scroll down. I always tell myself I'm done photographing it, but it's so surreal and impressive-looking that I can't stop. And, like Sam said when we ran into him on the train home, it does look sorta like a giant Santa hat, anyway. We had joked about spending the whole day wearing Santa hats to solidify our sense of Christmas cheer, and we decided to make that plan a reality. It was a lot harder than we'd anticipated. 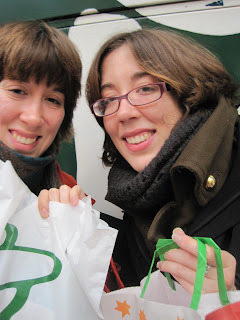 All the 100-yen stores we checked, as well as Don Quioxte, were fresh out of Santa hats, so we had to go a little out of our way and stop by Tokyu Hands, which has a pretty healthy costume selection and therefore seemed unlikely to be sold out. We found our Santa hats (I went for classic and Shannon went for bizarre, fluffy Santa bonnet) and promptly donned our gay apparel in front of the store where we bought it. 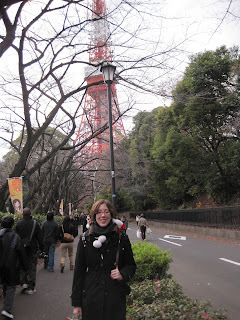 Then we headed back to the subway that would take us close to Tokyo Tower. If you want to get to Tokyo Tower from Ikebukuro, where the train line we take from my neighborhood ends and where we'd gone to buy the hats, you take the Marunouchi subway line to Otemachi, and then you transfer to the Toei Mita line and take that to Onarimon station, the closest station to Tokyo Tower. Apparently, we found out the hard way, the distance between the Marunouchi line at Otemachi station and the Mita line is absurdly far. I can't remember exactly how many meters, but it took us forever to get from one subway line to the other. It was convenient on the way back because we took the Tozai line from Otemachi to Takadanobaba, where we met Lynne for karaoke, but we were definitely late for our designated meeting time. 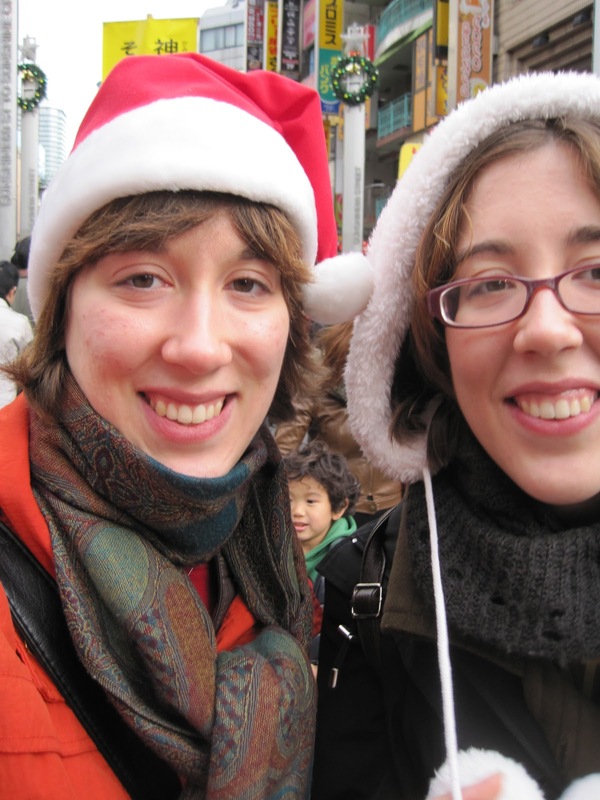 But it was totally worth it to get cute pictures with Tokyo Tower in our Santa hats! We also took a video, which Shannon is supposed to upload on her Youtube account, so I'll link it here if she does. We found someone to take our picture! Next on our Christmas schedule was to meet up with Lynne and do some Christmas carol karaoke. She knew a place that was actually inexpensive, so we went there and got unlimited soft drinks and two hours of karaoke time. The drink bar included hot chocolate, which was absolutely lovely and very seasonally appropriate. There were a surprising amount of Christmas carols, but some of them were kinda weird. Like this version of "Rudolph" that went on forever and got a little strange at the end. 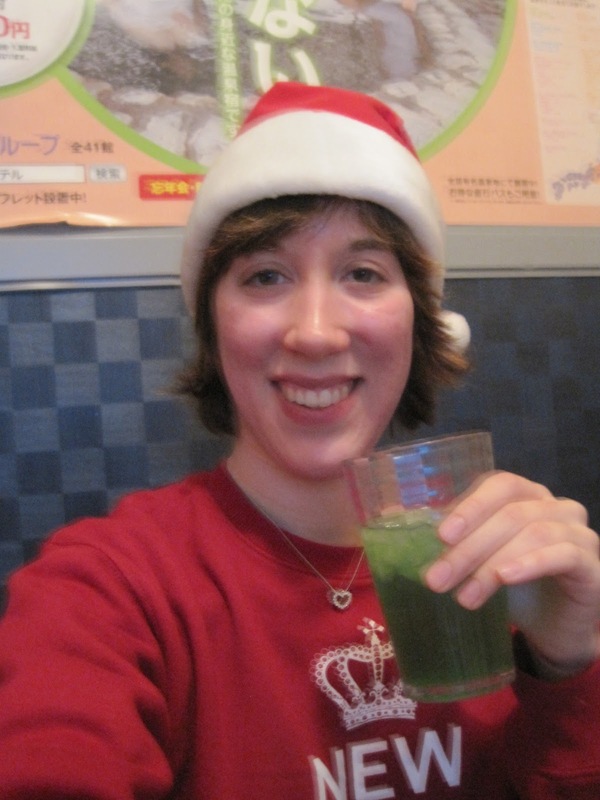 Nothing says Christmas spirit like melon soda and a red sweater. 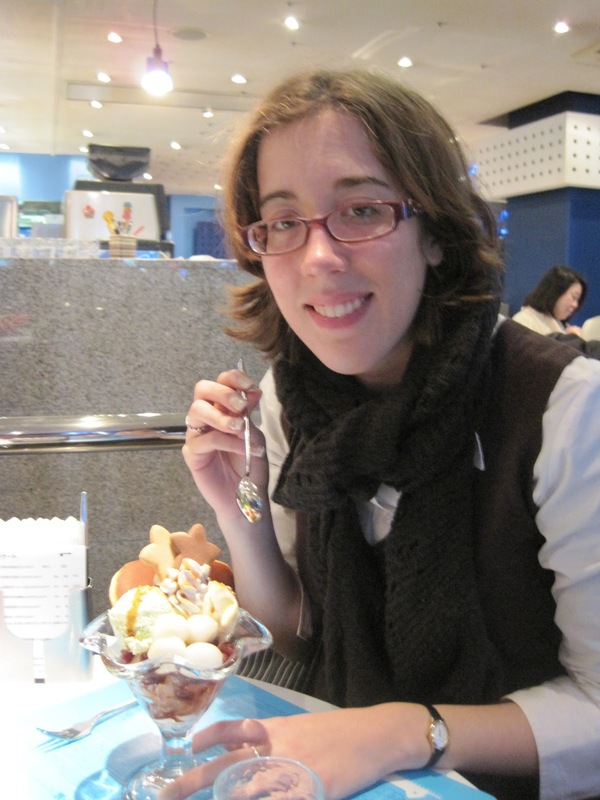 And the cute necklace my host family gave me for Christmas! A word about my sweater. When we went to the department store to buy Shannon's suitcase, we got distracted by a bunch of funny English sweatshirts. Mine was a version of the frequently parodied Keep Calm and Carry On, which made me laugh because, for whatever reason, the text was completely different from the original. 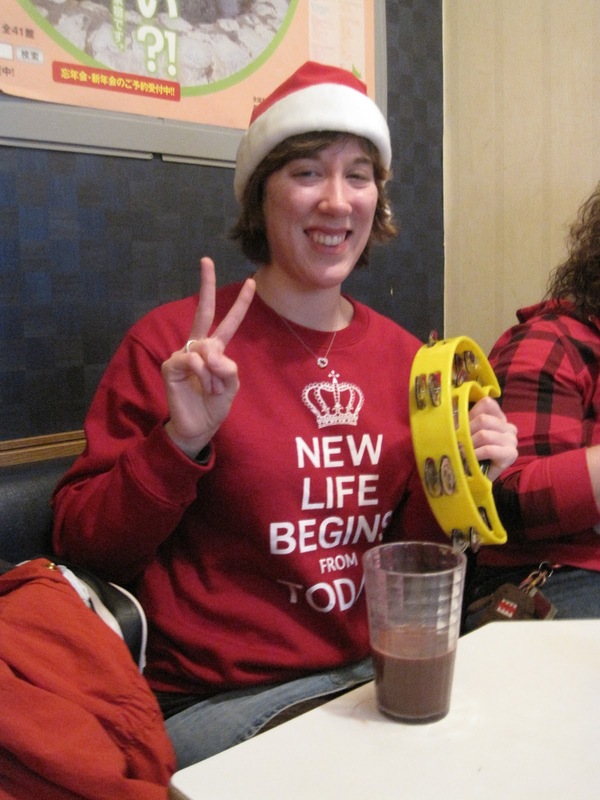 Then I realized how... uncomfortably religious... the message was on Christmas. It's a fun sweater though. Of course, we didn't just sing Christmas carols for two hours. We brought out the pop music and anime songs, and then I made the discovery that this karaoke place had a lot of the songs from Yu Yu Hakusho, an anime series that's really nostalgic for Shannon and me. We discovered that even though we hadn't really listened to the songs in a while, we somehow still knew all the lyrics. It was pretty hilarious. I also found out just how dumb some of these lyrics are. These were extra songs sung by the voice actors, made to sound like the characters were singing them, and at least one of the songs mentioned the characters' attacks and the Spirit World and stuff. Sometimes it's cooler when you can't understand, I guess. Next on our agenda was an all-you-can-eat okonomiyaki place, back in Ikebukuro. Okonomiyaki basically translates to "grilled as you like it." It's sometimes called a Japanese "pancake" or "pizza," but it's nothing like these things except that it's round and relatively flat. I was so into eating that I only took a picture while we were cooking the first batch, but I think I blogged about okonomiyaki before when Missus took me out for lunch? You sit at a table with a grill, and depending on the restaurant, either you make it yourself or they bring you the fully cooked okonomiyaki and you eat it off the grill so it's especially hot and fresh. The basic ingredient is a kind of batter that has some red pickled ginger in it and cabbage to hold it all together. Then you pick your fillings. In this picture, we have triple pork (buta-buta-buta, literally pork-pork-pork) and mochi-cheese. We also tried pork-kimchi and a mix flavor that had seafood in it. Mochi-cheese is my all-time favorite okonomiyaki, but the pork-kimichi one was good too. I don't think I liked kimchi before I came here, but I'd only ever had the kind on the Knox salad bar. At this place, you ordered your okonomiyaki and then they brought you a bowl of all the ingredients, which you mixed up and then poured on your grill. The hardest part was knowing when to flip the okonomiyaki and then flipping it successfully, but even if it wasn't pretty, it tasted delicious. After the okonomiyaki is grilled, you cover it with delicious okonomi-sauce and Japanese mayonaise, then top it with ao-nori (a type of seaweed, in little flakes, like a green version of the paprika at a pizza place) and katsuobushi (thin dried fish flakes). And then you eat it and it's amazing. I think us three girls at 6 okonomiyaki, plus the 5 sides they gave us (the ones we chose were edamame, kimchi, a small salad, and two different kinds of absolutely delicious meat that we cooked on our grill), plus the one drink that was included. I have never bought a more satisfying dinner in Japan. Our next quest was to take a purikura picture to remember the evening by. Purikura (an abbreviation of purinto kurabu - "print club") is a photo booth where you can take pictures and then customize them with writing and little pictures. Then it prints them out as a sticker sheet. There are all kinds of purikura machines that claim to make your eyes bigger, adjust your makeup, make your legs look longer and thinner, and generally turn you into a photoshopped diva princess. You can find purikura at most game centers (arcades), but the ones that really want to attract women will have whole purikura floors with lots of machines to choose from. While smoking is generally fair game in the areas with the slot machines, pachinko machines, and video games, it's prohibited in the areas where they want to attract women, aka the purikura and the crane machines. Some places also have "cosplay purikura," where they have an array of costumes that women can borrow for their photograph. Men are prohibited from wearing the costumes, which I'm thankful for, but it also seems like gender discrimination. I've also seen signs saying that it's okay for a man and a woman to go into the purikura section, but not more than one man together. I'm guessing this is one of Japan's confusing ways of trying to create a safe space for women, but once again, that's gender discrimination, isn't it? Probably a little bit of homophobia too. Anyway, we found out the hard way that girls and their dates will wait in line for their preferred purikura machine. The purikura floor of the Sega center near the okonomiyaki restaurant was full of people waiting in line. 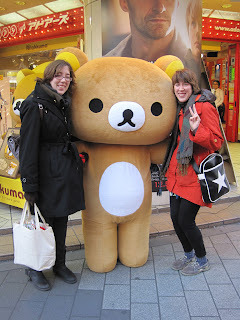 At first we thought the lines were just to do purikura at all, but we found a machine with no line, so we went for it. Turns out it was a pretty bad machine. The time limits were really short and you couldn't take full body pictures. We should have planned our poses before we put our money in. I also don't have a good digital copy of these photos. I can't download them on my phone anymore because I had to get rid of my smart phone, but I stuck the stickers in my journal. Then I photographed my journal. So enjoy the blurry result. All in all, it was a really fun and satisfying Christmas away from home. It was nice to use the day to just do whatever fun stuff we wanted and not worry about if it was silly or how much it would cost. The day after Christmas, Missus and Arisa took Shannon and I out to lunch at a really fancy restaurant at the top of Sunshine 60 in Ikebukuro. We had this crazy view of the city (you could actually see Takadanobaba from there!) and lots of fancy food. Second course, and my favorite. Pumpkin soup! And coffee. I just love tea-cups. On the way back from Sunshine 60, we ran into Rilakkuma! It was so cute, because he bows to thank you for taking a picture with him and with his stubby little arms and legs its adorable~! Then Shannon and I met up with Kali and finally got to exchange presents with her. Before she got to Tokyo, Shannon and I went to check out Meiji Jingu, the shrine to the Meiji emperor. I didn't take any pictures, but even though it's right near Harajuku, it's in a forest and so it was another nice escape from the city. We also bought and wrote ema, little wooden tablets where you write your wish and then hang them up at the shrine. The priests at the shrine pray for the wishes and there's something about writing something you want and hanging up for all to see that makes it real and permanent in a really nice way. I should have taken some pictures at the shrine. We took Kali to our favorite parfait place in Ikebukuro, good ol' Milky Way. I don't have any pictures of her here for some reason. Probably because she was photographing her food while I wanted to take her picture and then she gobbled the whole thing up super fast. 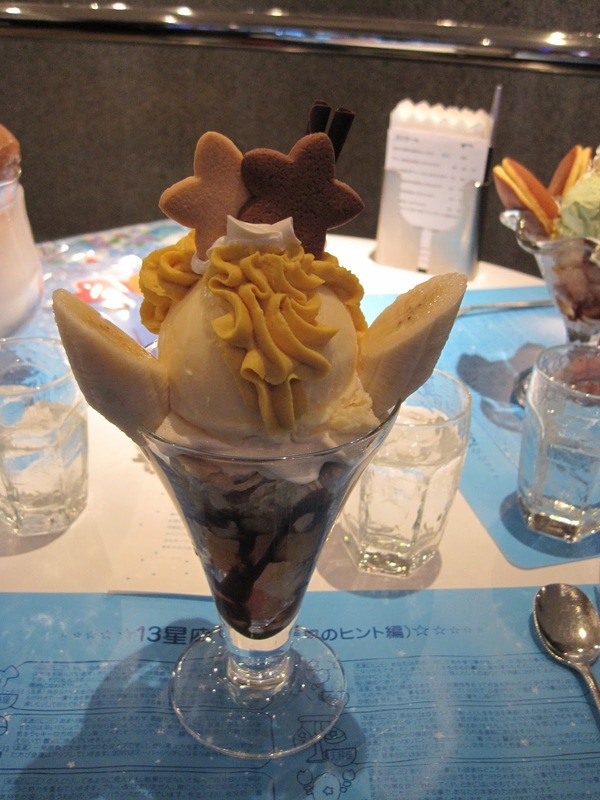 The Japanese sure know how to present food. It's almost too beautiful to eat, and it's so creative. Sounds like you had a great time singing and seeing the city. What fun!